We are pleased to offer the HABC Awards in Emergency First Aid at Work and First Aid at Work (HSE & RQF). This new qualifications are ideal for those already working or preparing to work within industry wishing to become an Emergency First Aider in the workplace for the purposes of the Health and Safety (First Aid) Regulations 1981. The course duration is 1 day; however this may be adjusted in accordance to meeting learner needs. recognising signs and symptoms of injury and illness assisting a casualty who is suffering from injury and illness. The qualification is assessed via on-going oral questioning, a short 10 question multiple choice question paper and practical demonstrations. The CIEH Level 3 Award in First Aid at Work (HSE & QCF) qualification is specifically designed for individuals who wish to act as a First Aider in their workplace. Delegates will learn how to manage a range of injuries and illnesses that could occur at work and will be equipped with the essential skills needed to give First Aid. By completing the course Delegates will have fulfilled their legal responsibilities regarding providing quality First Aid training. 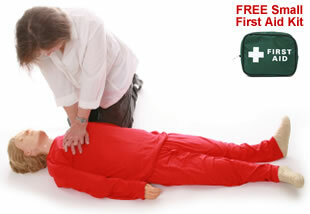 All our courses include the correct use of Automated external defibrillators (AEDs). This will give trainees the skills and confidence to use a defibrillator and perform CPR. “Great service. Took the time to learn about the site, both in terms of type & nature of injuries from accidents, so that the training could be tailored specifically to us. This enabled Dale to focus on ensuring that the first aiders are particularly well versed on the types of injuries that they will be dealing with – to ensure that they are prepared for what they have signed up to.